Choosing new siding for your home is a big decision, one that you will likely make only once or twice in a lifetime. There are many types of siding to choose from in the market today, including fiber cement, engineered wood, and insulated vinyl siding, each with their own unique features and benefits. As the inventors of insulated vinyl siding, we are frequently asked to explain what insulated vinyl siding is, what the benefits and drawbacks are, and how it’s installed. What is Insulated Vinyl Siding Made Of? Insulated siding is made of a contoured rigid foam backing permanently adhered to vinyl siding. Vinyl siding made up 39% of the siding market in 2013, making it the most popular siding in America, providing a low maintenance exterior and a wide assortment of design options, including hundreds of colors and various profiles like dutch lap, clapboard, board and batten, shake, and more. 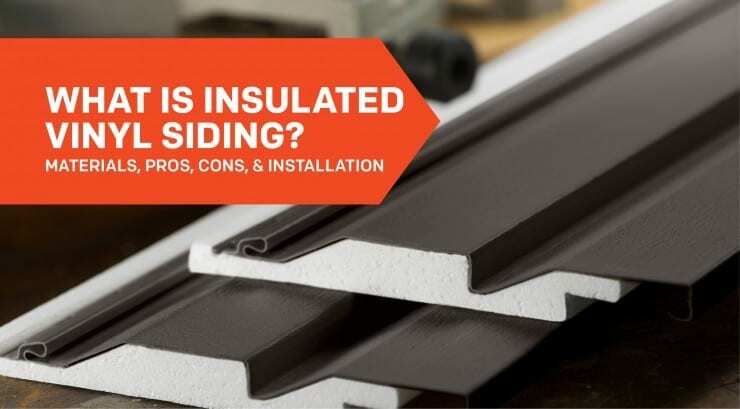 The insulation component of insulated siding is made of expanded polystyrene (EPS) rigid insulation, contoured to perfectly fit the profile of the vinyl siding. The insulation is permanently adhered to the vinyl siding panel during the manufacturing process. What Are the Benefits of Insulated Vinyl Siding? Insulated siding helps reduce heating and cooling costs by wrapping the home in a continuous blanket of insulation, keeping heat inside in the winter and outside in the summer. Even if you have pink batt insulation between your studs, there may still be an energy leak in your walls. The culprits are the wood studs: heat bypasses the insulation in the wall cavity and transfers through the studs, allowing energy to leak through the walls. This process is called thermal bridging. Nearly 25% of a home's wall is made of studs that typically aren't insulated, so it's like having one entire wall of the home without insulation. To combat this problem, the U.S. Department of Energy (DOE) says "when new siding is to be installed, it is a good idea to consider adding insulation under new siding." When you make an investment in new siding, you expect it to look great for a long time to come. Unfortunately, many siding products don’t look as good as they promised, or their appearance degrades over time through exposure to the elements. The insulation component helps create a great looking exterior by leveling the wall under the siding, reducing imperfections in the wall. The contoured insulation also provides more support to the siding panel, helping it maintain it’s shape and original appearance over time. Most siding products are made to make a home look great, but they aren't designed to provide protection for the house. In fact, traditional vinyl siding products create a hollow void between the back of the siding and the wall, leaving the siding itself susceptible to damage when hit by things like hail, rocks thrown from the lawnmower, or a child's baseball. Insulated siding provides significantly increased durability compared to traditional vinyl siding. The contoured foam insulation serves as a shock absorber against impact. Insulated siding stands up to the elements, whether they be from mother nature or man made. By wrapping your home in insulated siding, the inside temperature can be more consistent room to room. The insulation also helps dampen sounds from the exterior, making the interior more quiet. The foam insulation is treated with an insecticide that is safe for people and pets, but protects the insulation from termite damage. Insulated siding features a perm rating of up to 5.0, allowing your home to breathe and protecting against moisture damage. Despite some misconceptions in the industry that the insulation can contribute to moisture problems, studies completed with the National Association of Homebuilders Research Center proves that insulated vinyl siding actually keeps the wall system drier and more protected than most other siding system available on the market today. The primary drawback of insulated vinyl siding is that it’s more expensive than traditional vinyl siding, adding around 20-25% more cost to the job for a homeowner. Why Does Insulated Vinyl Siding Cost More? Insulated vinyl siding is considered a more premium product, traditionally made with higher grade vinyl siding that is less susceptible to damage. It is also available in more premium profiles and colors than standard vinyl siding. The manufacturing process of permanently adhering vinyl to contoured insulation provides more stability to the siding panel, but adds another step in the manufacturing process. It is slightly more expensive to ship to the jobsite, as fewer pieces fit in a box than traditional vinyl siding without insulation due to the additional thickness. The thickness can also require additional steps during installation. Special accessories and trim work around windows and doors can be required, adding to the cost of the job. Check out our article on the cost of insulated vinyl siding. 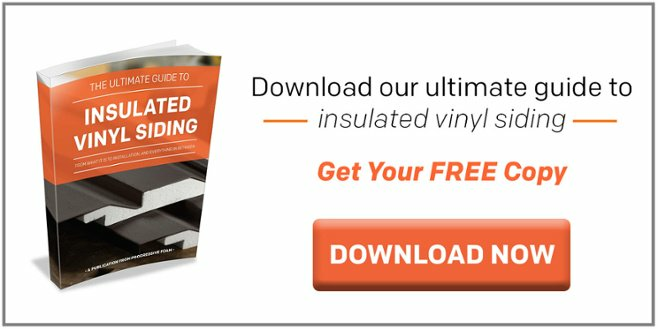 How Is Insulated Vinyl Siding Installed? Remove the old siding - This may be required depending on the siding that is currently on the home. Many times insulated vinyl siding can be installed over wood siding if there is no significant damage. Products like old aluminum or vinyl siding are typically removed. Correct any damage to the wall - Sometimes pre-existing damage is revealed when old siding is removed from a home. If there is any moisture or termite damage, holes in the wood sheathing, etc. this will all need to be corrected before new siding is installed. Add a weather resistive barrier - Although not required in all situations, it is generally considered a best practice to install a weather resistive barrier such as housewrap before new siding is installed. This helps protect the wall system from water damage. Install the accessories - Before any siding goes on the wall, it’s important to trim out all windows, doors, and corners. These accessories will create a pocket to receive the insulated vinyl siding for a professional, finished look. A starter strip will also be installed by snapping a level chalk line. Install the insulated vinyl siding panels - After all the prep work is complete, the wall is now ready for siding. Insulated vinyl siding comes in many profiles; the speed of installation will depend on the particular siding product being used. The bottom of each panel locks into the previous row of siding, and then is attached to the wall through the nailing hem. Finishing the top of the wall and tight spots - Custom cuts will need to be made of siding is being installed in angled areas, gables, or tight spaces. Check out our article How to Install Insulated Vinyl Siding in 9 Steps. If you are willing to invest more in your siding project up front, the added benefits of insulated vinyl siding can provide peace of mind, lower utility bills, and a beautiful home for many years.